Are you a fan of chestnuts? If so, was this an acquired taste for you? I've been a chestnut-lover for most of my life, only because roasted chestnuts figured prominently in two family traditions that took place during the holiday season. One: my grandmother and my mother and I would go together to see the Christmas windows of Manhattan's department stores, and my grandmother would buy me a small paper bag of roasted chestnuts from a street vendor, to eat as we walked along. Two: my grandparents prepared roasted chestnuts as part of the dessert course on Thanksgiving and Christmas, roasting them in the oven after my grandfather had made a small X or cross on each one with the point of a knife (to prevent them from bursting). 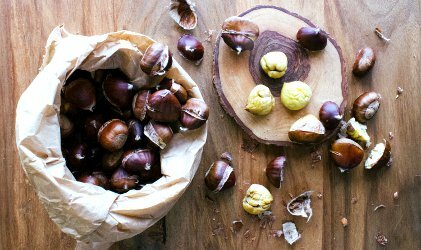 These happy memories surrounding the chestnuts, not to mention the chewy, buttery enjoyment of the nuts themselves, would make me want to try any fragrance with a chestnut note. But why do so few perfumes try to capture this sensation? Way back in 2009, Diptyque offered a limited edition holiday candle in a scent called Marrons Grillés. It was stunning, but they never brought it back. L'Artisan Parfumeur Noir Exquis has a chestnut note, but I'm not too fond of the rest of its composition. I liked Nez à Nez Marron Chic but missed my chance to purchase it before it was discontinued. Late last fall, however, indie perfumer Dawn Spencer Hurwitz launched Châtaignes du Bois as its annual holiday fragrance; it's "a rich and cozy-warm melange of woods mixed with the tempting aroma of roasted, sweetened chestnuts." Finally! I've been wearing Châtaignes du Bois during a cold spell and finding it very satisfying. This evocation of chestnuts is heavy on the sandalwood, which feels a bit raw and almost earthy; the wood is joined by wisps of frankincense and smoky oakmoss — there's the roasting — and some burnt sugar and maple notes suggest the different, but equally tasty, pleasure of candied chestnuts. Châtaignes du Bois is a bit more masculine than my typical fragrance wardrobe, it's a good change of pace for a chilly day, like wearing an oversized men's wool sweater. A few months ago, Hurwitz released Tsukimi (Moon Gazing), a new addition to her "haiku" collection. It's a tribute to the Japanese autumn festivals that celebrate the moon and the harvest, "with warming notes of cardamom and sandalwood made luminous by rosewater and a light dusting of fig." I've just finished off my sample vial, and I'm craving more. There's sandalwood here, too, but it's more enmeshed with the other notes, especially some rich yet soothing resins like benzoin and opoponax. I don't usually care for fig perfumes, but the fig note here is subtle and becomes part of the scent's creamy aspect (with a hint of vanilla, too). I'm wondering whether Robin would classify Tsukimi as a "wood pudding" fragrance. It's a little spicy (cardamom! ), softly sweet (but not exactly a gourmand), and woody underneath. It's cozy in an unusual but still very wearable way. That's why I've paired it with Châtaignes du Bois in this review: it's not a chestnut fragrance, but it might appeal to someone who finds nutty notes oddly comforting and who likes other scents that cross the lines between woody and spicy and gourmand. Both fragrances last well on skin, giving the wearer plenty of time to link them with old memories as well as new experiences. Dawn Spencer Hurwitz Châtaignes du Bois and Tsukimi are available in a variety of sizes and formats. For more information see the Dawn Spencer Hurwitz Perfumes website. Note: top image is Roasting Chestnuts and an Autumn Salad [cropped & rotated] by Amelia Crook at flickr; some rights reserved. There is actually a place here in Houston that has Marron Chic. It’s on sale 30% since it’s discontinued. I’d be happy to get it and send it to you if you want it. Email me at countsjc at the gee mail. I was about to comment the same thing! I’ve been eyeing the L’Hetre Reve, but the Marron Chic is lovely too. You’re welcome! I need to figure out how I can find them year-round, because I love them so much. The whole ritual of buying the little (overpriced) brown bag from a street vendor is important to me, but my oven at home is fine as an alternative. I’m glad you’ve reviewed these. I’m dying to try them both. Never too late, hah! I don’t know why I don’t try to find/cook/eat them year-round. My supermarket only has them during the Christmas season! Fresh ones are only available for a short time but the vacuum-sealed ones are in Chinatown year round! It would probably be perfect in a stew, pilaf, or pasta. Thanks for reviewing these, Jessica! I’ve gotten lazy to sample DSH because there are so many of them, but I like the ones I have very much (Scent of Hope, Mata Hari, Le Smoking and Cimabue). I also like Marron Chic (although it’s a bit sweeter than I prefer), so I will try to sample these two. Cimabue is a DSH cult classic! I love many of her florals and gourmands. She’s so creative! I won a rollerball of the Châtaignes on cafleurebon in December. It’s a great holiday scent, but I’m sure I’ll keep wearing through the cold weather. I also received a sample of Tsukimi but need to give that one a solid trial. Oh, nice score. I can definitely imagine wearing it throughout the winter, and then again next autumn. I purchased a rollerball of the Chestnut fragrance and received a sample of Tsukimi. They really got me through the East coast cold spell. I love Dawn. She is so generous and her perfumes arrive as works of art.